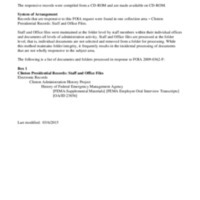 This collection consists of oral interview transcripts of Federal Emergency Management Agency (FEMA) employees recorded for the Clinton Administration History Project in 2000. Employees were asked to describe how they thought the public perceived the Agency, and what changes both good or bad had occurred during the Clinton Administration. Employees across the Agency were interviewed. There are 53 employees interviews, including the FEMA director, James Lee Witt.